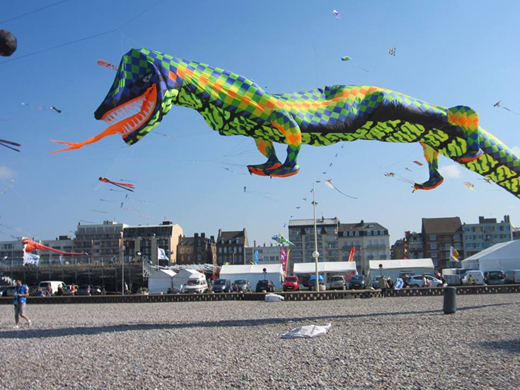 Mangalore, Sep 19, 2014: Team Mangalore, a hobby group of kite flyers and makers exhibited its natural gift for kite flying and creating excellent kites, at the 18th International Festival of Kites at Dieppe in France. The team had created Vibishana (a 30-foot kite named after the younger brother of Ravana) and Sangama (a 12-foot kite that depicts Indian Culture) and train kite faced Yaksha for the show. Other kites ‘Devendra,’ ‘Gajaraja,’ ‘Pushpaka vimana,’ ‘Bharthanatyam,’ ‘Durga,’ ‘Garuda’ also found a place in the sky of Dieppe. India and Indonesia were featured as ’guests of honour team’ at the festival. India was made up of Team Mangalore, Mumbai Golden Kite Club and Puppet Team of Rajasthan. Dance performance by the Indian settlers in France and Indonesia’s Elima Bogus Team was another highlight of the event. ‘The International Association Tagore Sangam’ founded on the initiative by an Indians in France, Azarie Aroulandom depicted the life of Rabindranath Tagore through photography exhibition. 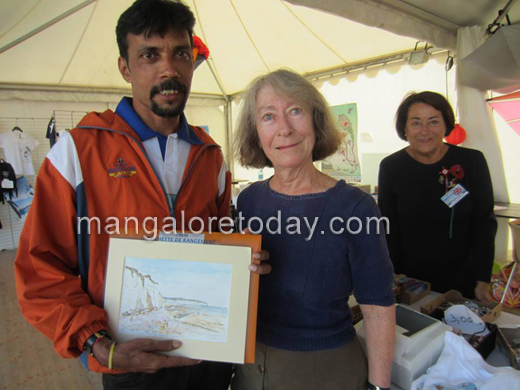 Member of Team Mangalore Dinesh Holla exhibited his line drawing works titled ‘Pebbles’ at the exhibition stall of the festival. Many of his art works at the stall were purchased by art collectors and visitors. Dieppe Mayor Sebastian Jumiel, felicitated Dinesh Holla with a letter and certificate in recognition to his talent in designing the publicity poster of the festival. The line art sketch of Holla was chosen as the official poster of the International Dieppe Kite Festival. The poster was widely attracted by the onlookers at the festival, said a press release. The kites of Team Mangalore are a showcase of the workmanship of Sarvesh Rao. The subject of Indian culture and its colour combination brought recognition to Team Mangalore at the festival. 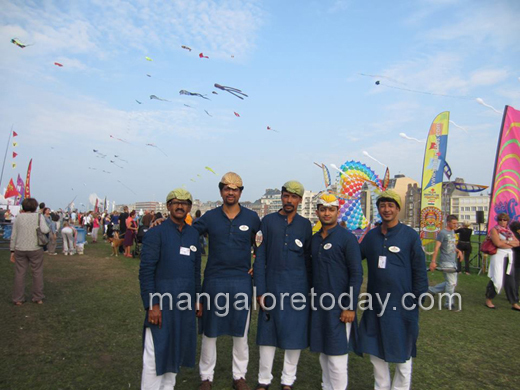 Team Mangalore’s ‘Katakali’ kite holds a place in Limca Book of Records. Team Mangalore has already participated in international kite festivals at UK, Canada, Italy, South Korea, Hong Kong, Thailand, Sri Lanka, Dubai and Qatar. Team Mangalore is looking forward to its making of new creations ‘Matsyakanya’ and ‘Maharaja’, said a press release from Sarvesh Rao. The events helped to enthuse the kite lovers.